So you drew the short straw and are now the man in charge of planning the bachelor party. 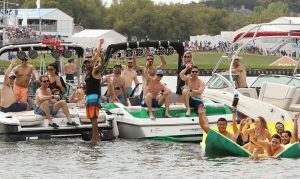 We know everyone loves the party…few love the huge task of organizing a group of guys (that you may or may not know) to pull off an awesome weekend for your bachelor. 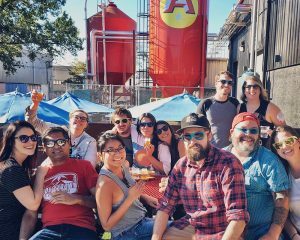 Lucky for you, throwing an Austin bachelor party is easier than it looks. If you have decided to have your Austin bachelor party here in Texas you are already on the fast track to an amazing weekend. Austin has 300 days of sunshine a year. Win. 100 new restaurants opened last year alone. 20 minutes to the lake, 45 minutes to the river, and craft beer pretty much around every corner. Plenty of ways to party that don’t involve strip clubs (although if that’s your thing, awesome we have those, too). Bar districts, adventure sports, outdoor activities…you name it, Austin has it all. Bachelor party groups in Austin have two main options for lodging: vacation home (such as Airbnb or locally founded Homeaway) or hotel. It really depends on the vibe you’re going for and the neighborhood you want to be in. Here are a few of our favorites. The pros of downtown lodging are many and obvious. Being walking distance to attractions such as Sixth Street, Rainey Street, and hot restaurants will save a lot on late-night transportation. You’ll be right in the middle of the action, making it easy for the group to split up if someone wants to go home early or forgot their jacket. Potential negatives include noise…it’s fun if you’re making it but not so much if you’re trying to catch some Zzz’s! It is also typically more expensive than other neighborhoods. Last, you’re more or less restricted to hotels with this option, although there are a few condos for rent. Hipster, a bit grungy, and filled with street art and lots of food trucks, East Austin has a funky vibe all its own. A favorite part of town for locals and those favoring a more low-key atmosphere, it is still a fun place to hang your hat for the weekend. East Sixth features bars like hipster honkytonk The White Horse and cocktail-king Whisler’s. Some of Austin’s most notable restaurants are also located in this part of town. Another pro is that this is the mecca for Airbnbs (much to the disgruntlement of the neighbors…make sure you show some respect when you come home late night! ), there are lots of vacation rentals. Very few hotels. Downside is you’re away from the downtown action (if you consider that a downside) and it does feel a bit sketchy and deserted after dark, even if it’s really not and is plenty safe. Another downside is those neighbors. Being in a residential area means you’ve really got to keep a handle on the noise, because no one is shy about calling the cops on a noisy house…and we have seen groups evicted for rowdy behavior. South of Lady Bird Lake and north of Oltorf Drive is the place to be in South Austin. 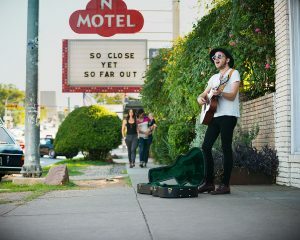 The best options are within walking distance of funky South Congress Avenue’s shopping district or even some of South First’s unique hangouts. Upsides here are the full-on local Austin charm. This part of town exemplifies our Keep Austin Weird feels, and it’s peaceful, laid back attitude will make everyone a little happier. Several good restaurants and food trucks around the South Congress area. Short ride to downtown, and this area offers a few boutique hotels as well as vacation rental options. Possible downers are the nightlife…or rather lack thereof. Not too much going on in this part of town after dark. We’ve seen a lot of Austin bachelor party groups opt for the far, far away option. Maybe they got a good deal. Maybe it was a super sweet house. Maybe they just didn’t realize how far away it was from everything they would want to do here in Austin. Positives of hanging on the perimeters are obviously price and space. Houses get bigger, you might even find one with a pool. The Texas Hill Country is a beautiful part of our world, so being able to enjoy the stars and the views is top notch. Neighbors are also fewer and farther between, so noise complaints become less of an issue. However put a lot of consideration into the idea that money saved on the front end will often be paid tenfold when you’re actually there. Ubers to far away places are expensive, tours will often charge more to pick you up for your place, and you will lose a lot of time (which you didn’t have much of to start with!) going back and forth, often in Austin’s nightmarish traffic. OMG Austin has some amazing food. Since restaurants are constantly opening, closing, moving, and improving/decreasing in quality, we thought some guidance might be better than specifics restaurants. Make reservations. Our city food scene is nuts, and I recently had to wait an hour for a table for two on a Monday night. If you’re with a group with no reservation, you’re in trouble. And if they say there’s no wait…maybe reconsider your restaurant choice. Jk Jk. But seriously. Make reservations. If you’re staying at a hotel, we recommend letting your hotel concierge assist you with reservations before arrival…they get all the best perks and you’ll often get a free appetizer/dessert/drink or at least the best table! Don’t skip out on the food trucks. Some of our city’s best food can be found at these restaurants on wheels. Pro eaters in Austin know that food trucks are awesome because groups don’t have to agree on a cuisine (everyone can order from the truck they want), you don’t need a reservation (great for dinners post-river float or other activity where you’re unsure of timing), and best of all…they’re BYOB! Dress code in Austin at 99% of restaurants ranges from casual to…casual. The occasional steakhouse wants you looking a little spiffier, but every other New American, hip venue will be cool as long as you feel cool. Don’t wear swimsuits or pajamas, but other than that you’re good. If you wanna get dressed to the nines, feel free to, but don’t be surprised when the locals do not. Foods not to miss out on: Texas BBQ (order the beef brisket), breakfast tacos, kolaches (let our friends over at Batch Kolache help you out with this…would make an awesome morning delivery), and Tex-Mex (with lots and lots of queso, that’s cheese dip for those of you from the North). Drink local. Don’t be the guy ordering a Bud Light in the bar. We have hundreds of incredible Texas craft beers. Ask your bartender for a recommendation and help support the local economy, not to mention doing your tastebuds a favor. Every article you read (or don’t read) will tell you the basics: Sixth Street, Rainey Street, hit the lake, float the river, go to Barton Springs. So we’re going to throw some oddball ones at you and maybe help you plan an Austin bachelor party that you may actually remember, instead of one constant booze fest. Don’t get me wrong, you can totally drink while doing pretty much all of these activities. 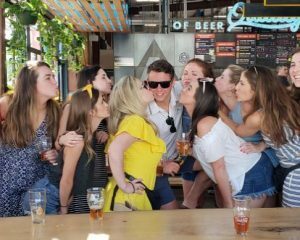 We’re not saying to skip Rainey Street or anything, just that we want to give you some off the beaten path Austin bachelor party experiences. Go fast. Austin is home to Circuit of the Americas, America’s only Formula One racetrack and a competition-level karting course. These go-karts hit 55mph. Throw some axes. There’s nothing more exhilarating than hurling an axe at a target (maybe or maybe not pretending it’s someone who’s pissed you off lately). Plus, Urban Axes is BYOB and you can bring in food as well. Lake Austin Boat Rentals & Lake Travis Boat Rentals: Float On Boat Rentals has great rates, friendly staff, and the highest rated boat rental company in Austin. Eat BBQ. It’s a great pre-drinking meal. We recommend hitting a lot of spots, easily done on Access ATX’s Texas BBQ Trail tour. Shoot things. The Range at Austin offers a wide array of guns to try out, as well as shooting lessons for the uninitiated. Golf, the easy way. While Austin has quite a few exceptional golf courses, the easiest way to get your guys swinging is with a visit to Top Golf. Not only is it simpler than booking a tee time, it works better for groups and you have a server that will keep the cold beers coming. Test your brains at a local escape room. Pro tip, we recommend doing this BEFORE your first night on Sixth Street rather than after. Hang ten at NLand Surf Park. This giant man-made surf destination offers lessons, all the surf gear you need, and a brewery on-site. Get out of town! We know your time in Austin is short, but a day in the Texas Hill Country can be a chill way to spend your day. Discover breweries, distilleries, or get out on the water at one of our many lakes and river floats. And no trip to Austin is complete without a wild ride on the Twisted Texas Brew Bus. Austin bachelor party groups have named it their favorite part of the weekend (if you don’t believe us check our TripAdvisor page!). 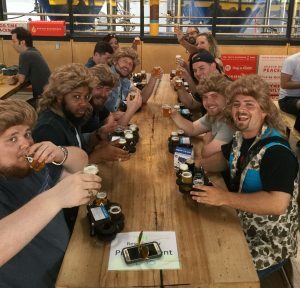 With a live band on board the bus jamming as we visit three local breweries places, this adventure takes the planning away and leaves only craft beers and good times. Well we hope this helps get your bachelor party planning kicked off. If you have other questions, we are always happy to help out. Just give us a shout at 512-999-TOUR or shoot us an email hello@twistedtexastour.com. 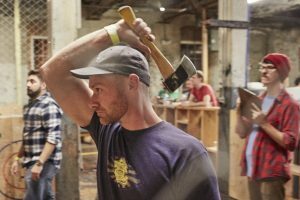 Don't miss out on Austin's craft beer boom! Spend your time at three of Austin's most badass breweries. Drink special/new releases, take a behind-the-scenes brewery tour, and party with our live band on board the bus! Want help planning the entire weekend?